DESIGNER MODELS NOW OPEN! Schedule a tour of Greyson's 5 model homes, decorated with designer details and learn about the incredible amenities in store. We dare you to compare — you simply won't find anything like it! 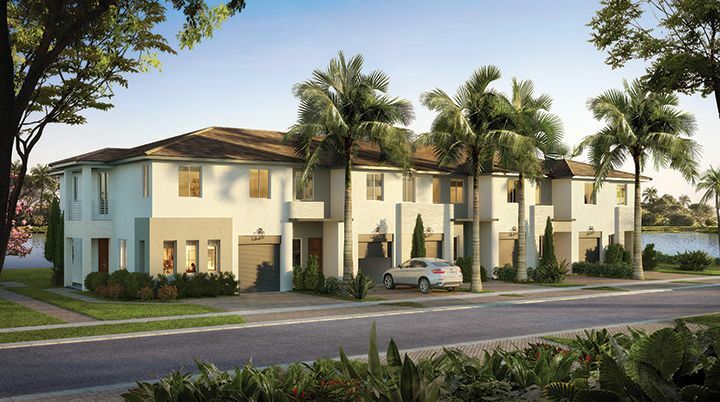 93 Contemporary architectural style townhomes, 3-4 bedrooms, 5 floor plans and endless ways to make it your own with our designer style finishes. Each LUXCOM home we build comes with our Quiet Home Promise™ — steel reinforced poured concrete floor between the 1st and 2nd story and exterior CBS construction on the 1st and 2nd floor means homes are luxuriously quiet and built to last for generations. Unbeatable location and convenient to world-class equestrian events and facilities, top-rated schools, parks, premier shopping and dining, abundant city venues and spectacular white beaches. Award-winning design, thoughtful architectural details and more choice in finishes than ever before sets Greyson in a class of its own. Relax in the serene sophisticated allure of a lake-side cabana beside a sparkling pool. Plenty of green space surrounds the stocked lake and includes a dog park, kids playground, volleyball and bocce ball courts and community fishing pier. All this within your own private gated community. Open daily 10am-6pm.